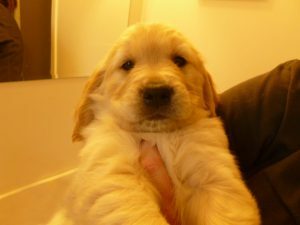 Who knew this cute little ball of fur was going to get into so much trouble? 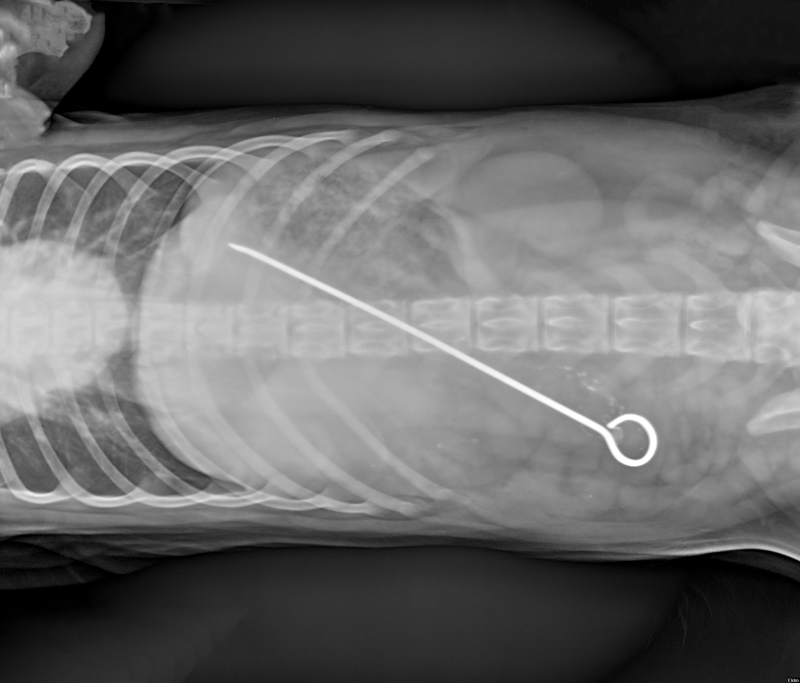 Recently, we saw a lovely 6 month old Golden Retriever pup who had been rushed to the emergency service at Twin Trees in Whistler for abdominal pain. 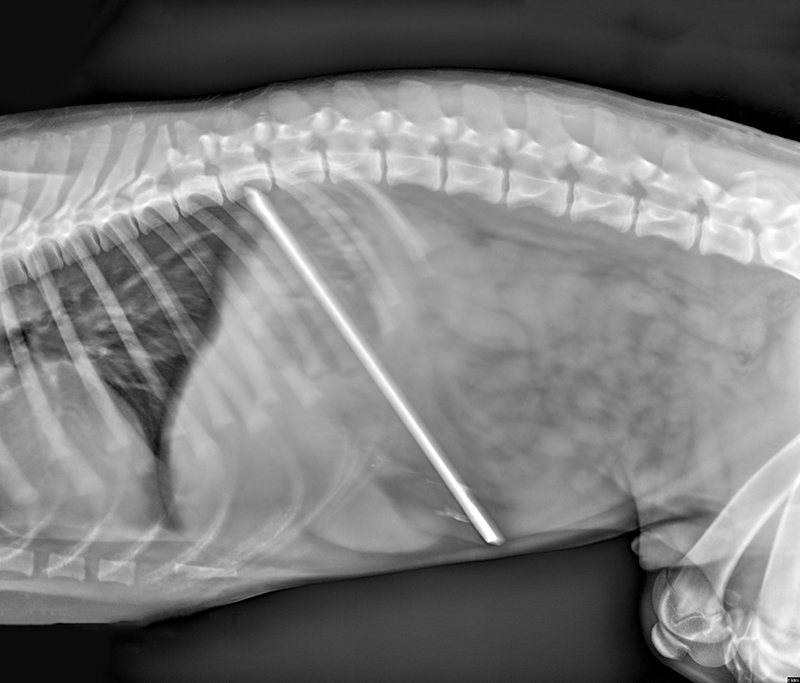 We took Taffy to surgery; the skewer had perforated the stomach and diaphragm. Happily, Taffy has made a full recovery, and will hopefully not attempt any further sword swallowing. What are other BBQ and summer party hazards? The pit of stone fruits (peaches, plums, mangoes, apricots, nectarines) can cause issues either as a choking hazard or can get stuck to the lining of the intestines and cause an obstruction. Again, without surgery, the obstructed portion of intestine becomes unhealthy and can lead to that area leaking or dying. 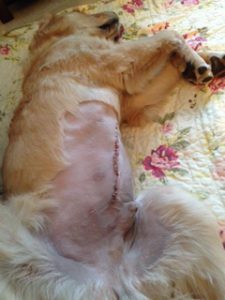 Given the cases we have seen in our emergency and surgery departments, in our opinion, neither cooked nor raw bones are completely safe for your dog to eat. Large pieces of bones can cause obstruction (for example, in the esophagus) and chewed bone splinters can pierce the bowels. Even if they don’t swallow something whole, many dogs will develop an upset stomach from sneaking a taste of rich BBQ, with a resulting pancreatitis or hemorrhagic gastroenteritis as worse case scenario. If you are attending a BBQ, please ask your friends ahead of time not to give your dog any table scraps or treats so that you can enjoy the party and not have to deal the worry and expense of a sick pet afterwards. Have fun but be vigilant!